This report is the result of research into the science of contrail formation and an analysis by observation and measurement of contrail persistence. This research was inspired by the claims of an unnatural type of trail known as Chemtrails as an attempt to detect such trails. observed at the same time 50 miles to both the northeast and southeast on two of these occasions. For several years the existence of an unusual type of aerial activity has been reported, generally termed Chemtrails. 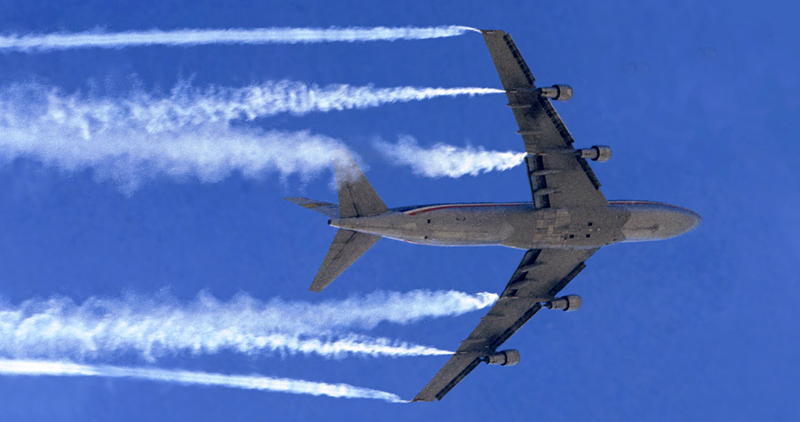 Chemtrails are purported to differ from typical contrails in their high degree of persistence and subsequent spreading, as if a substance had been released. The purpose, effects and existence of these so-called Chemtrails are widely debated, however essentially there is a claim made by many that they are witnessing something out of the ordinary, beyond an ordinary contrail. Chemtrails are also said to sometimes differ in their configuration from contrails, as they are supposedly not about getting from point A to point B, but, rather, dispersing some type of substance. While it is scientifically accepted that normal contrails may persist for hours and spread, the research represented in this report attempts to use the tools available to make a scientific analysis into the veracity of the Chemtrail claims by attempting to isolate any data that might show evidence of such activity. The measurements and observations described in this report can be repeated by anyone who is willing to invest their time and a small amount of resources in a Flight Explorer subscription. If the hypothesis needs to be modified repeat steps 3 and 4 until there are no discrepancies between theory and experiment and/or observation. 1. The long-lasting trails that have been described as unusual by many are the area of interest in this study. Is there such a thing as a Chemtrail, a man-made addition to natural phenomena, that can be detected? 2. Hypothesis: There is a new type of trail that is not consistent with normal contrail persistence and normal contrail formation physics. 3. An analysis of trails, contrails and the presumed Chemtrails, should show whether any such anomaly was present. The prediction is that if the given hypothesis is true then there will be evidence that there is a category of trail that exhibits persistence inconsistent with and beyond verified normal contrails. To be valid, a hypothesis must be disprovable, or falsifiable. This hypothesis is falsifiable if inconsistent data is not found. 4. The rest of this document is concerned with describing the tools and methods used to collect data and a detailed presentation of that data. Jet aircraft leave behind a heated mixture of water, carbon dioxide, nitrogen oxides, sulfates, unburnt hydrocarbons, soot, etc. as by-products of the combustion of fuel in the engines. Water and particulates play a fundamental role as the basic foundation for the formation of a contrail. Pre-existing particles in the air will serve as nucleating bodies for the warm water to condense around, creating larger droplets that will quickly freeze given the appropriate atmospheric conditions. Fresh soot from the exhaust is generally hydrophobic, but over time can become hydrophilic, and thus suitable as condensation nuclei. The ability of the resultant ice crystals to last is governed by the ambient moisture at flight altitude. So, temperature serves generally as a threshold mechanism for the production of contrails and increased moisture provides slower sublimation rates and thus longer dissipation times for contrails. (Evaporation, often incorrectly applied to the process of contrail dissipation, is the process of a liquid changing to vapor. Sublimation is the process of a solid changing to vapor, bypassing the liquid state.) Various numbers are quoted as the threshold temperature for contrail formation: -40C, -38C, -35C. In this study, the warmest temperature at which a contrail was observed was -41C. In practice, the speed of dissipation of a contrail can be from a few seconds to hours. This varies with differing atmospheric conditions due to seasonal, daily, and frontal weather changes as well as global placement as varying local temperatures and humidity at flight levels provide differing ranges of persistence. The observations made in this report are all from Houston, TX. The conditions that support contrail formation are present, but not in an overabundance. In this study, the longest-persisting contrail observed from a known identified aircraft was approximately 25 minutes. This occurred on one occasion, out of 53 documented observations. The next longest in persistence were trails lasting approximately 2 minutes. This occurred on about 5 occasions. Most contrails observed were in the 5-20 second range. Unidentified flights were observed to produce trails with persistence from 20 seconds to several hours. Houston, TX 1/20/01 5:57-6:07pm: Example Flight Explorer Display. Red indicates greater than 27,000 ft, Orange are lower altitude, and Blue have landed. Flight Explorer Personal Edition is an Internet-based flight-tracking tool that allows the user to obtain information about commercial, passenger, and private flights. All flights utilizing IFR (instrument flight rules) submit a flight plan to one of the regional ARTCCs (air route traffic control centers), this information becomes part of the FAA supplied datastream that is used by Flight Explorer. Aircraft flying via VFR (visible flight rules) are not part of the datastream, however this is irrelevant to this study since the lowest altitude at which contrailing was observed during research was 31,000 ft. and there are no VFR flights allowed in a Class A airspace, above 18,000 ft., although there is one very rare exception to this rule. Military flights are filtered from the datastream by the FAA for security reasons. The filtering algorithm used removes flights that don’t include a number, which reportedly may filter some foreign jets. The documentation says that Canadian flights specifically are not filtered and personal observation shows that Mexican aircraft, common in this area, are not filtered as well as dozens of other international flights. Also some flights are marked as blocked which means that the identifying information is hidden, however the altitude, aircraft type and other information are still available. The majority of flights in the Houston area are arriving at or leaving from Hobby (HOU) in the southeast part of town or Bush Intercontinental Airport (KIAH) to the north. A main flight corridor runs over the center of the city with traffic flying at 2,000 to 8,000 ft. as they descend for landing at Hobby Airport. There is typically not as much traffic above the 30,000 ft. level relative to all flights shown on FE. High-level traffic includes occasional flights to and from Mexico, along a roughly north-south route, as well as flights to and from other parts of Texas, Florida and other states. See the animated Flight Explorer screen shot above to compare traffic above and below 27,000 ft.
Houston, TX 12/11/00: a sample Skew-T Atmospheric Sounding Diagram. Atmospheric pressure is converted to altitude in feet based on standard conversions, which allows reading the data values for a given altitude from the numerical table titled “GOES PROFILE” on the right side of the sounding. This table contains values that are represented graphically by the dark red line (temperature) and the dark blue line (dewpoint temperature). The closer these two lines come together the more humidity is present, which combined with cold enough temperatures, will produce conditions favorable to contrails. Higher and lower altitudes are at the top and bottom of the graph respectively, which is vertically labeled in units of pressure known as millibars (P<mb>). Most of the contrailing flight altitudes are in the range of 300 to 200 mb, which is approximately 31,000 ft. to 40,000 ft. The difference between temperature and dewpoint in degrees celcius (T<c> – TD<c>) is utilized as a humidity measurement, sometimes called the temperature/dewpoint spread, referred to in this report as degrees of separation. The degrees of separation is a relative humidity measurement that provides a consistent measurement across different temperatures which affect the ability of the air to hold moisture. A value of zero, when the temperature is equal to the dew point, indicates the highest humidity and the most ideal conditions for contrail formation, although lack of sufficiently cold temperatures could prevent contrail formation. In this study contrails were observed at up to 17 degrees of separation. The NOAA/GOES soundings are measurements taken, ideally, hourly in clear and semi-clear conditions. The measurements are not guaranteed to be perfect due to instrument calibration, bias and error. The measurements are representative of a local area of the sky which will differ to some degree from the observation site. For each day of the research period general weather conditions are recorded. Also notations are made of any specific contrails observed and associated measurements. A specific notation is made for days that have highly persistent trails that evolve into cirrus aviaticus. The GOES atmospheric soundings are first checked to verify that there is a new sounding available for the current hour. Availability of this online resource has averaged about 30-40% of the time during the data collection period, although this included about one month of continuous downtime. Normally the soundings are available about 70% of the time. If observations are taken, the sounding image is saved for historical reference, and the pertinent text from the “GOES PROFILE” table is recorded for reference. This process will be repeated if the observation period spans multiple hours thus requiring the latest sounding. Nearly 50 skew-T charts have been archived and are available in this report, although some sounding charts were not archived in cases where the next hour’s sounding was identical or nearly identical or many soundings were utilized. Flight Explorer is scanned for flights that will be passing over the local area. Typically, the filtering of flights below 28,000 ft. is done to remove irrelevant planes on the screen display. From the center of the city most of the flights arriving or leaving from Hobby and Bush Airports are not viewable because these flights are not passing over at contrailing altitudes or because of their descent, with the exception of the low-level landing corridor for Hobby which runs over the center of town. Most of the contrailing jets observed are just passing over and through the Houston area, so these flights are of primary interest when tracking flights on Flight Explorer. After locating a candidate flight on the tool, an attempt is made to visually observe and measure persistence of the contrail from the jet as it passes nearby, or a trail may be observed and measured then immediately correlated with Flight Explorer. A contrail will occasionally pass over existing persistent trails as well as visually clear sky areas. This will result in a non-consistent sublimation time as areas of the sky that happen to already contain concentrated moisture from highly persistent trails will trap overlapping segments of new contrails. The measurement that is recorded is the sublimation duration in the areas visibly clear of preexisting moisture. Timing of the duration is achieved by counting seconds or using a stopwatch while observing the time from initial contrail formation to subsequent complete visual dissipation of contrail. As many measurements are taken of each contrail as possible to ensure accuracy. If the jet cannot be correlated with absolute certainty due to ambiguity with other nearby jets on similar courses, the observation is abandoned and not recorded. This occurs with about 10% of sightings. Once the persistence measurement is taken, the time and date, and selected flight data from Flight Explorer are recorded. Then temperature and degrees of separation are calculated from the atmospheric sounding table. Data values for flights at altitudes between measured sounding altitudes are figured by interpolating and estimating values. The data collected via the previously described steps constitutes the confirmed contrail observation data. This data is presented in the data collected section of the report. The primary issue at this point is that the highly persistent trails that are of prime interest in this study have not been captured in the confirmed contrail observation data, thus it is necessary to adjust the data collection procedure in order to collect their data. The sky is observed for flights leaving highly persistent trails. Upon making such an observation, Flight Explorer is checked to determine if it can be identified. If so, the original procedure is followed. If the jet does not appear on Flight Explorer an unidentified observation is recorded. The trail left is observed over time to gauge the persistence. The persistence from these flights is difficult to measure due to the scale of persistence. While most confirmed contrails are less than 30 seconds and can be measured multiple times for accuracy, these trails last on a scale measured in hours. The observed trails continue to exist until the upper-level winds have blown them out of sight. One highly persistent trail was measured for as long as it could be viewed from one location at well over 5 hours of persistence. As the exact altitude is not available via Flight Explorer, the atmospheric data that is recorded is taken from the altitude that has the most favorable conditions for contrail persistence at that hour. This provides the “benefit of the doubt” best-case conditions. A snapshot of the FE screen may be taken, with direction and location of flight drawn in. The Flight Explorer screens for confirmed unidentifiable jets leaving highly persistent trails are presented below in the data collected section. Since the unidentified flights cannot be tracked with Flight Explorer, it is difficult to collect a sufficient volume of data for confirmed unidentifiable flights. To augment the data, an additional process is utilized. Once for each day during the research period that very highly persistent trails were noted, the above process describing use of data from the most favorable contrailing altitude is performed. The data collected via this process constitutes the unconfirmed highly persistent trail observation data, and is also presented below. The following table represents the data collected for each Flight Explorer confirmed contrail observation. Note that this data includes a few observations with no contrail at all, which are useful for establishing threshold values for contrail formation. Length indicates the length of contrail persistence in seconds. Separation represents the degrees of separation between temperature and dewpoint at the given altitude. Altitude is in feet. Type indicates the basic aircraft type. Times marked with a “~” symbol are approximate values. The following table represents the confirmed unidentifiable jets that were observed leaving highly persistent trails of several hours or more. Length is a generalized range as the exact value is difficult to determine due to the large scale of persistence. As mentioned in the data collection process, “Sep.” representing degrees of separation and “Temp.” representing degrees celcius are the best-case values for contrail production for that day. Soundings weren’t available for the last two observations. Screen-shots of the display on Flight Explorer and pictures are available for these observations as indicated. This final table below is a day-by-day summary of observations over the data collection period. First is an indication of whether or not skies are generally observable or not, with an “X” indicating overcast conditions. Next is an indication of any precipitation. The next column indicates if any highly persistent trails of several hours persistence were observed. Some of the “X”’s in the Persistent Trail column are linked to photos of the Houston sky for that day. Then the minimum and maximum persistence of any Flight Explorer confirmed contrails for that day are shown. Contrails were generally present every day during the study, although there was at least one day where no contrails could be observed. The next two values are the best-cast contrailing degrees of separation and temperature pair recorded for that day. The final column is a link to the GOES atmospheric sounding diagram for that day. Note that soundings are often not provided by NOAA for overcast days. Atmospheric soundings were unavailable from 12/23/2000 to 01/19/2001 due to a hacker attack on NOAA computers. This section provides graphs that were created from the data collected during the research period. The first set of graphs are all derived from the Flight Explorer Confirmed Contrail Data. This chart shows the relative frequency of Flight Explorer confirmed contrails of varying lengths grouped into 30 seconds bins. This chart shows that most (80%) confirmed contrails are 30 seconds of persistence or less. This chart shows the relative frequency of Flight Explorer confirmed contrails of varying lengths with observations grouped into 5 seconds bins. This chart shows that for the confirmed contrails with 30 seconds of persistence or less, most are in the 6-10 second range. This graph illustrates the persistence and distribution of Flight Explorer confirmed contrails over the observation period. This graph shows the temperatures and altitude for all confirmed observations. Regardless of the presence of contrails, the general trend of colder temperatures at higher altitudes can be easily seen. This graph shows persistence and altitude for all confirmed contrails. This graph shows separation and altitude for confirmed contrails. This graph shows separation and altitude with largest sample excluded to provide more detail. Notice that there is a general non-linear trend that larger degree of separation values provide shorter persistence times and smaller degree of separation value provide increasing persistence times. This trend is subject to the variable of temperature, which is shown in the next graph. This graph is similar to the previous graph but with each observation color-coded by relative temperature. In addition to the confirmed contrail observations graphed in the previous chart, the confirmed observations with no contrail are included. These extra data points appear along the left edge of the graph since their persistence is zero seconds. These observations with no contrail appeared at an altitude that may have had a sufficient humidity, as indicated by the degrees of separation, but not at an altitude cold enough for contrail formation, as can be seen from the red and orange colors indicating warmer temperatures. The same data as presented in the last graph, but with temperature represented on the x-axis and color-coded by relative persistence. Red indicates longer relative persistence and blue indicates shorter relative persistence. The general trend of more persistence in cold high-humidity conditions is seen. Note that, in this and the preceding graph, points with a speckled appearance represent two samples at the same graph location with different color-coded values. This plot is a 3D visualization of the confirmed contrail data graphed on three axies: persistence in seconds, degrees of separation and temperature degrees celcius. Those who might be interested can download the 3D Graph application and the datafile to view this model. The model can be rotated with the keyboard or mouse and can be viewed in 3D via various methods. The 3D Plot application may be downloaded from here. Datafile with confirmed contrail data can be downloaded from here. The following graphs begin to utilize the Flight Explorer Confirmed Unidentifiable Jets data and Daily Conditions data. Observations of Flight Explorer confirmed contrails and highly persistent trails from jets not appearing on Flight Explorer are graphed for persistence and by date. The persistence of the highly persistent trails is an approximate generalized value of 6 hours, actual persistence could be shorter or longer. The magnitude of persistence makes accurate individual measurements difficult due to logisitical and temporal challenges. This graph provides a general comparison of conditions on days with cirrus aviaticus/highly persistent trails versus those without. The temperature value represents the temperature that, in conjunction with the associated degrees of separation at that altitude, provided that best conditions for contrailing from the set of atmospheric readings that were recorded for that day as part of this study. The comparison reveals that, with respect to temperature, the conditions under which highly-persistent trails were not seen are very similar to those under which they were seen. This graph corresponds to the previous except that this indicates the best degrees of separation from the most favorable altitude for contrailing. The separation values seen in both categories overlap for a majority of their span. All confirmed contrail observations as well as unidentifiable flights are plotted for persistence and separation. The persistence of the trails left by unidentifiable flights is an approximate generalized value as discussed before. This chart shows the daily conditions during the 105-day observation period. Days are generalized as overcast or not, with an additional indication for the presence of rain. For the observable days the presence of cirrus aviaticus/highly persistent trails is shown. A cursory examination of the data with respect to a correlation of cirrus aviaticus and the presence of precipitation shows no discernable trend. The process of collection of data about contrails, such as altitude for use in atmospheric analysis, revealed that the highly persistent trails were being produced by flights that did not appear on Flight Explorer. The inability to gain altitude information and the temporal challenges in measuring their complete persistence impedes an analysis analogous to that for the confirmed contrails; however these factors indicate that this is a unique category of trail. 12/8/00 1:00pm, Houston, TX: Unidentifiable Jet Leaves Highly Persistent Trail Strip and Contrail. The unidentified jet is shown leaving a contrail of 20 seconds on the right side of the photo. Other identified flights at similar altitudes were observed to produce contrails of 10 seconds this day. On the left side of the picture, a highly persistent trail with a length equivalent to about 10 seconds of travel time is left after the plane is gone. The plane continued along its northward vector with the 20-second trail. The trail segment persisted for as long as could be observed as it slowly drifted to the east. At 550 MPH this relatively short segment would be approximately 1.5 miles long. To view full sequence for this event and more details, click here. The contrail is similar in magnitude, however slightly longer than the contrails left by identifiable traffic this day. Although the exact altitude, and thus the corresponding atmospheric conditions at that altitude cannot be determined, this contrail has been found to be consistent with specific identifiable traffic during the same hour of the same day and at similar altitudes. The highly persistent trail is entirely inconsistent with the trends of identified trails observed this day. These highly persistent trails have a persistence more conveniently measured in minutes or hours, as opposed to seconds. The length of persistence of these trails has not been accurately measured due to the fact that they persist for longer than can be observed from a given location. It would be necessary to utilize a vehicle to follow these trails and produce such a measurement, however one highly persistent trail was timed at over 5 hours. This particular measurement was limited by line-of-sight visibility, the actual persistence was longer. The goal of this research was to determine if there was a type of trail that was inconsistent with normal contrails, especially with regard to increased persistence. What was found is that highly persistent trails that last for many hours were seen above Houston, TX on a majority (60%) of observable days during the data collection period. However during this time period none of the 46 Flight Explorer confirmed contrails observed persisted for over 30 minutes and most contrails were under 30 seconds of persistence. Additionally it was discovered that the jets that were responsible for leaving highly persistent trails that last for hours did not ever appear on Flight Explorer and were documented for 8 separate instances, including one instance with two jets in formation. These unidentifiable jets were found to produce a contrail that was consistent with confirmed contrails during the periods when they weren’t leaving highly persistent trails. Highly persistent trails are often seen in the form of isolated relatively short strips, as well as large areas of cirrus aviaticus clouds, but on rare occasions have been seen in totally unique grid and wheel formations. It is hoped that others will endeavor to repeat these observations and publish their results. By repeating the basic observations for persistence length and whether the flight appears on Flight Explorer, it will be seen whether or not a trend emerges confirming the existence of a unique category of trail. Atmospheric differences due to higher moisture and colder temperatures in different locations will produce greater maximum persistence observed for identifiable traffic. For those in locations with greatest contrailing potential, the task of collecting data on highly persistent trails from unidentifiable flights will be hardest. In this research I have gone to great lengths to measure and characterize my observations as accurately as possible in order to provide the clearest representation possible given the resources available. 1/6/01 Sunset, Clear Lake, TX: Dark cirrus aviaticus clouds and backlit trail segments. To view Report Summary click here. To view Home Page click here.